An Ethiopian Army general says he has defected to join the Oromo Liberation Front (OLF), a rebel group backed by neighbouring Eritrea. 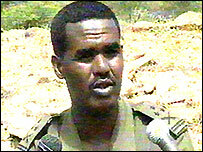 Brig Gen Kemal Geltu told the BBC he had crossed the border into Eritrea with more than 100 soldiers. He said would fight the Ethiopian government because force was the only language it understood. He said his hopes of peace had been dashed after last year's turmoil that followed disputed elections. Gen Kemal previously commanded Ethiopia's 18th army division. Shooting is reported to have broken out as he crossed the frontier, during which two soldiers were killed. Reliable sources say he was accompanied by a colonel and 150 troops. "It's a big force in hundreds. I don't want to mention the number. It will continue, I can confirm this. There are other soldiers in other areas in big numbers," he told the BBC's Focus on Africa programme through a translator. Gen Kemal, who was speaking from Eritrea's capital, Asmara, said his intention was not "to give [military] secrets to the Eritrean government". Ethiopian television said Gen Kemal had asked for further promotion soon after being promoted to the rank of brigadier general, but after this was rejected in engaged in "divisive activities". "Although his colleagues repeatedly tried to correct the commander from his anti-government and inappropriate activities, the commander was not willing to change," the television report said. But the general said reports that he feared military reforms were "lies, pure lies". "Our first hope was to bring about a change in Ethiopia to bring about peace and for the peoples to live in equality, including the Oromo people, but the last year's experience is war, not peace. Our hopes were dashed and that's why we went out," he said. "The language they (the Ethiopian government) understand is force and we're going to challenge them by force." The OLF which was at first a secessionist movement says it is fighting for more rights for the Oromo people in Ethiopia. The Oromo are the largest ethnic group in Ethiopia, comprising about half of its 70m people. Demonstrations after Prime Minister Meles Zenawi was re-elected in May 2005 led to a crackdown on many Oromo and other opposition organisations. Ethiopia and Eritrea ended a border war in 2002, but Ethiopia has not withdrawn troops from the town of Badme which arbitrators awarded to Eritrea, and tensions between the two countries remain high.